YOUNG people making a pilgrimage to Krakow this month are a “summons” to the entire Church to ditch the “bad systems” which encourage a merciless heart, Archbishop Mark Coleridge said. Commissioning more 70 pilgrims at a Mass at St Stephen’s Cathedral on July 10, Archbishop Coleridge said the parable of the Good Samaritan, which was the weekend’s Gospel reading, exemplified the problems of a “bad system” which, at the heart, was merciless. “Down through the ages these two characters whom we have just met, the priest and the Levite, have got a decidedly bad press,” Archbishop Coleridge said. The “bad system” prioritised ritual purity over obedience to God’s law in order to maintain a steady income to feed their families. “And in fact these were men who were dead keen to obey the law of God, scrupulously, and yet the bad system makes that impossible,” Archbishop Coleridge said. 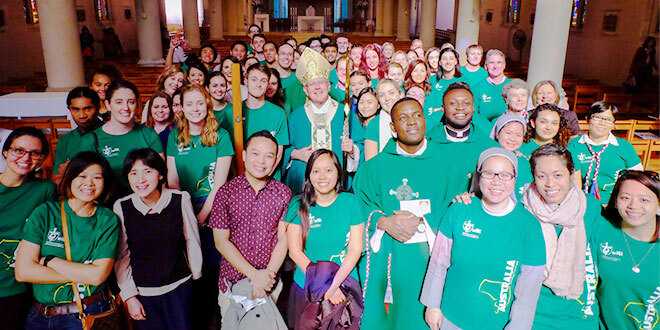 By embarking on the WYD pilgrimage, young Catholics from Brisbane were choosing to “cross the road” and be an example of a system that upholds mercy, the theme for WYD. “They’re crossing the world but they’re really crossing the road and in doing that they become a cause or a summons to the whole Church to go in search of the good system, to purify the Church of all that is not merciful so that the Church can be merciful as the Father himself is mercifcul,” he said. “Because what does the Father do in Jesus? “Cross the road and comes and picks us up. Archbishop Coleridge, who is remaining in Brisbane during the WYD, said he would be with the pilgrims spiritually. Bishop Joseph Oudeman will be representing the Brisbane bishops in Krakow. Archbishop Coleridge prayed over the pilgrims, asking them to offer their gifts to the universal Church. “You must also seek to bring something to the faithful in Poland, not just to take but to give,” he said. Young Catholics headed to WYD from Brisbane include the official archdiocesan pilgrimage, Vinnies Youth Queensland, students from Australian Catholic University, the St Stephen’s Cathedral Young Adults Ministry, Marist Youth Ministry, Brisbane Catholic Education staff, and parishioners from Wynnum, Ipswich and the Gold Coast. The Catholic Leader will be reporting from Krakow during the WYD between July 25 and 31. Follow the pilgrimage journey on our website at www.catholicleader.com.au, on our social media channels and in the July 31 and August 7 editions.